Hailing from verdant jungles on the banks of the Amazon river: a big nut. A nut you might just like to get to know better. At some point in early childhood, someone told me that brazil nuts were elephant toenails, which, trusting soul that I am, I believed. If you have ever seen a brazil nut in its shell, you could see how this might be conceivable to a five-year-old…don’t judge me! In their hard shell, brazil nuts look impenetrable and nearly prehistoric. But crack away! The large nut inside is full of valuable nutrition. 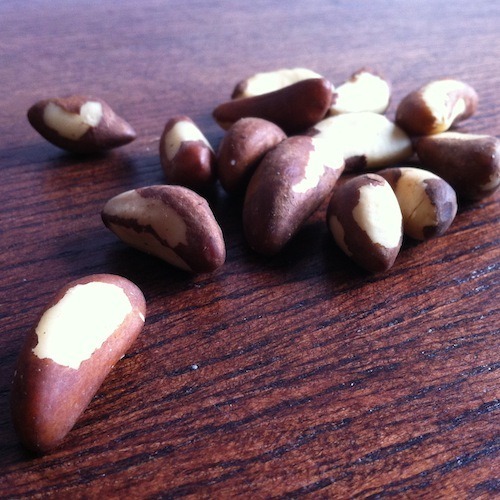 Above all, what is most impressive nutrient-wise about brazil nuts is their selenium content. Just three nuts contain approximately 200 micrograms of selenomethionine, a highly absorbable form of selenium. Selenium is an antioxidant that contributes to the formation of the body’s master antioxidant, glutathione. Selenium is also needed for proper thyroid hormone function. Selenium in the diet is linked to lower rates of certain chronic diseases, such as diabetes and cancer . However, selenium toxicity is possible so it is best not to exceed consuming 6-8 nuts per day for long periods of time. Brazil nuts are also very high in minerals like calcium and magnesium. We all know about these minerals and their important role in the formation of strong bones, but calcium and magnesium are required for hundreds of different metabolic functions in the body on a daily basis. For example, did you know that your heart needs calcium and magnesium to beat? The heart requires both minerals to create the contraction and relaxation phases that makes up a single heartbeat. In 6-8 brazil nuts, there is over 100 mg of magnesium and about 50 mg of calcium. That’s enough to make your heart flutter! Phytosterols are fat compounds found in plants that are similar in structure to animal-based cholesterols. Because phytosterols are so similar in structure to cholesterol, they compete for absorption and therefore can reduce the uptake of dietary cholesterol. For this reason, sterols have long been recognized as a way to lower high LDL (or “bad”) cholesterol and triglycerides . The main plant sterol found in brazil nuts is called beta-sitosterol. In addition to cardiovascular applications, beta-sitosterol has also been used to treat various immune issues. For example, beta-sitosterol can help prevent immune suppression associated with intense athletic training . It has also been used to treat general immune system dysfunction  and has promising applications in the prevention and treatment of cancer . ** Caution – It estimated that one Brazil Nut can contain up to 160% of your daily selenium needs. Selenium toxicity is a health concern if we over consume foods high in this mineral. This blog post series is meant to encourage diversity in the diet.